MTA Debate Team Does It Again! 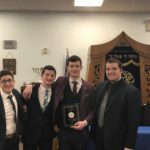 On Monday, March 18th, the MTA Debate Team headed over to Rambam for an exciting debate. Upon arrival, all teams received the topic they were going to debate and had just one hour to prepare. The topic, Should Congress pass an amendment that would end the Presidents’ ability to issue Executive Orders?, was an interesting one and the team was ready to go, despite limited preparation. The MTA team was happy with their performance and was was named runner-up school for outstanding debating.